These Mayline Corsica wood veneer conference tables and matching conference room furniture feature elegant lines with excellent durability and functionality. Available in Sierra Cherry or Mahogany finishes. This office furniture features AA-grade select North American hardwood veneers through out. These modular conference tables can be extended to over 30 feet and they have an all veneer surface that is protected with two coats of high-tech catalyzed lacquer. 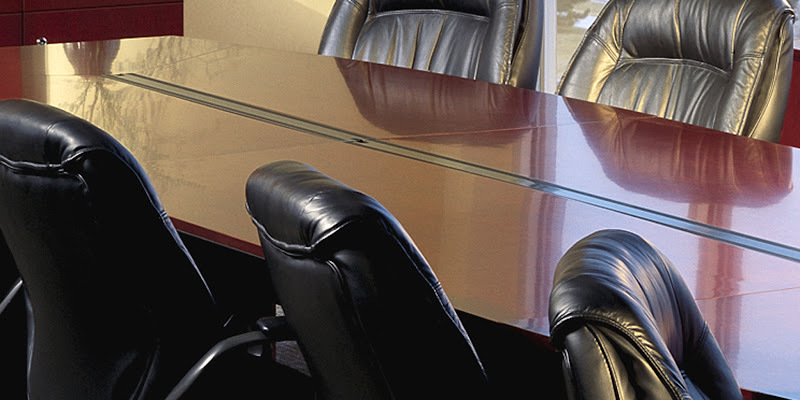 You can add optional power modules with wire management capabilities to these conference tables. The Corsica Series Conference Tables (Boat Shaped) come with a built-in cable management panel featuring a flush, removable steel cover. 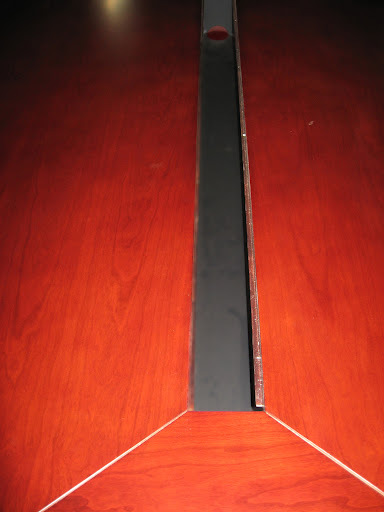 The table top is 2" thick with a black beveled edge. The work surfaces are protected with two-coats of high-tech catalyzed lacquer finish. For tables 12' and longer, REAL Office's patent-pending modular table design is utilized combining starter and adder sections. For tables larger than 30', simply order the additional CMT72A adders to increase size of 26' and 30' tables in 6' increments. Tables that are larger than 96"L have multi-piece top surfaces connected via steel cam fasteners and steel connecting plates. All of the models feature a boat-shaped surface. The tops and base ship separately. The Corsica Series Conference Tables (Boat Shaped) come with a built-in cable management panel featuring a flush, removable steel cover. The table top is 2" thick with a black beveled edge. The work surfaces are protected with two-coats of high-tech catalyzed lacquer finish. For tables 12' and longer, REAL Office's patent-pending modular table design is utilized combining starter and adder sections. For tables larger than 30', simply order the additional CMT72A adders to increase size of 26' and 30' tables in 6' increments. Tables that are larger than 96"L have multi-piece top surfaces connected via steel cam fasteners and steel connecting plates. All of the models feature a boat-shaped surface. The tops and base ship separately. The Corsica Series Conference Tables (Boat Shaped) come with a built-in cable management panel featuring a flush, removable steel cover. The table top is 2" thick with a black beveled edge. The work surfaces are protected with two-coats of high-tech catalyzed lacquer finish. For tables 12' and longer, REAL Office's patent-pending modular table design is utilized combining starter and adder sections. For tables larger than 30', simply order the additional CMT72A adders to increase size of 26' and 30' tables in 6' increments. Tables that are larger than 96"L have multi-piece top surfaces connected via steel cam fasteners and steel connecting plates. All of the models feature a boat-shaped surface. The tops and base ship separately. The Corsica Series Conference Tables (Boat Shaped) come with a built-in cable management panel featuring a flush, removable steel cover. The table top is 2" thick with a black beveled edge. The work surfaces are protected with two-coats of high-tech catalyzed lacquer finish. For tables 12' and longer, REAL Office's patent-pending modular table design is utilized combining starter and adder sections. For tables larger than 30', simply order the a dditional CMT72A adders to increase size of 26' and 30' tables in 6' increments. Tables that are larger than 96"L have multi-piece top surfaces connected via steel cam fasteners and steel connecting plates. All of the models feature a boat-shaped surface. The tops and base ship separately. 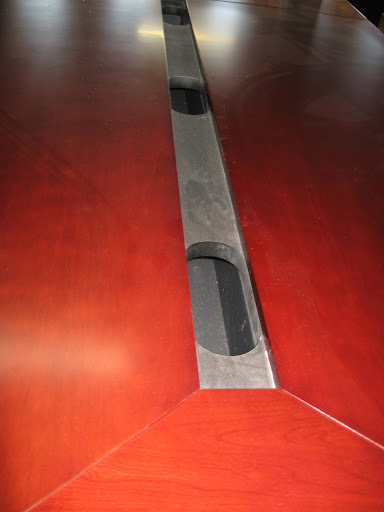 The Corsica Series Conference Tables have a built-in cable management panel features a flush, removable steel cover. The table top is 2" thick with black beveled edge. The work surfaces are protected with two-coats of high-tech catalyzed lacquer finish. For tables 12' and longer, REAL Office's patent-pending modular table design is utilized combining starter and adder sections. For tables larger than 30', simply order additional CMT72A adders to increase size of 26' and 30' tables in 6' increments. Tables that are larger than 96"L have multi-piece top surfaces connected via steel cam fasteners and steel connecting plates. The tops and base ship separately. The Corsica Series Conference Tables (Boat Shaped) come with a built-in cable management panel featuring a flush, removable steel cover. The table top is 2" thick with a black beveled edge. The work surfaces are protected with two-coats of high-tech catalyzed lacquer finish. For tables 12' and longer, REAL Office's patent-pending modular table design is utilized combining starter and adder sections. For tables larger than 30', simply order the additional CMT72A adders to increase size of 26' and 30' tables in 6' increments. Tables that are larger than 96"L have multi-piece top surfaces connected via steel cam fasteners and steel connecting plates. All of the models feature a boat-shaped surface. The tops and base ship separately. The Corsica Series Conference Tables (Boat Shaped) come with a built-in cable management panel featuring a flush, removable steel cover. The table top is 2" thick with a black beveled edge. The work surfaces are protected with two-coats of high-tech catalyzed lacquer finish. For tables 12' and longer, REAL Office's patent-pending modular table design is utilized combining starter and adder sections. For tables larger than 30', simply order the a dditional CMT72A adders to increase size of 26' and 30' tables in 6' increments. Tables that are larger than 96"L have multi-piece top surfaces connected via steel cam fasteners and steel connecting plates. All of the models feature a boat-shaped surface. The tops and base ship separately. The Corsica Series Conference Tables (Boat Shaped) come with a built-in cable management panel featuring a flush, removable steel cover. The table top is 2" thick with a black beveled edge. The work surfaces are protected with two-coats of high-tech catalyzed lacquer finish. For tables 12' and longer, REAL Office's patent-pending modular table design is utilized combining starter and adder sections. For tables larger than 30', simply order the a dditional CMT72A adders to increase size of 26' and 30' tables in 6' increments. Tables that are larger than 96"L have multi-piece top surfaces connected via steel cam fasteners and steel connecting plates. All of the models feature a boat-shaped surface. The tops and base ship separately. The Corsica Series Low Wall Cabinet with Doors features a choice of wood/glass, all-wood, or all-glass door sets. The sets of doors lock separately, but are keyed alike. It includes one adjustable shelf on each side. The Corsica Series Buffet features two cabinet compartments (one adjustable shelf in each) and four drawers. It is designed for audio/visual support including cable pass throughs and an inset back panel for wall plug clearance. All drawer and cabinet interiors are full-finished veneer. The Corsica Series Presentation Board has a white dry-erase board center panel (45" x 45"). The sculpted lower tray holds markers, erasers, etc. It features a magnetic, non-ghosting surface, and tackable light tan interior door inserts. It also has a full-height brass hinge.